Features: Strong Knitting,UV Stabilized for long life. With rich industry experience & knowledge, we have been able to provide the best array of Anti Hail Net. 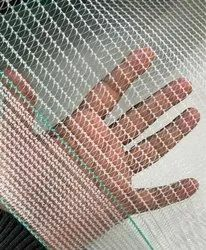 We are flourishing in the manufacturing of Anti Hail Net. Our anti hail net is made with premium quality & 100% virgin HDPE material, which is UV protected for the effective safety. The anti hail nets can be procured from us in white, blue, green, red and other custom made colors. The product remains functional for 2 to 3years under the average hail storming during season. Sun Safe Agrotextiles Pvt. Ltd.
We have emerged as a prominent supplier, wholesaler, trader of quality-approved Anti Hail Net. Backed by years of industry experience, we are engaged in offering a premium quality range of Anti Hail Net. We are a leading manufacturer and supplier of Anti Hail Net. These nets are fabricated using high quality raw material with the help of latest technologies. These nets are highly durable in use and are widely demanded due to their wide application. 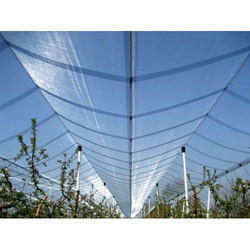 The anti-hail nets are now surely the most effective, practical and economical to protect their crops from hail. They can also reduce sudden temperature changes and wind gusts that would damage most crops.